Vision and Scarlet Witch #2 – “Faith of our Fathers” delves further into the complicated back story of the Scarlet Witch and her “father” Robert Frank. Turns out he’s not really their father, but Scarlet Witch and Quicksilver have been keeping that on the down low. They have a huge supercomputer with a teleconnection to the moon in the living room of an otherwise nondescript home in the suburbs. In fact, it’s quite near the covered porch where Jarvis is enjoying a spot of tea after the altercation in the last issue. No danger, just my dad at the door. Better be sure I’m wearing the full costume, though, while I talk to my brother who is ON THE MOON! Robert Frank still actually thinks he’s the father of Wanda and Pietro. Quicksilver’s power is super speed. So was Frank’s when he was a hero in the 50s known as… wait for it… “The Whizzer”. Wanda and Pietro have never told Frank he’s not really their father. But face it, I couldn’t bear to bring heartache to an old man who still goes by “The Whizzer” either. 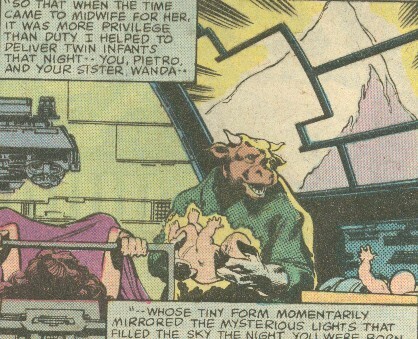 Wanda and the Vision get around town via taxicab – even though one can fly and the other can teleport. The issue starts out, wonderfully, in media res. The splash page shows the Vision, arm melted into a twisted slag. The guy can turn hard as a diamond or completely intangible. The sight of the Vision – in pain, arm smoldering brings immediate intensity to this issue. Who knew this was even a thing that could happen? Via flashback, the readers come to see just how Vision got into this mess. And, delightfully, it involves more family drama. Robert Frank has another son, Nuklo, a 32 year-old nuclear beast with the mind of a child. Frank wants the Vision and Scarlet Witch to help him take back custody of his abandoned child from the research facility where he is being kept. Once again, the art is wonderfully ahead of its time for a comic of this era – minimalist, yet striking use of lines and shading. And, the non-linear storytelling really works – helping parcel out more complex backstory and the emotional trauma while maintaining tension. 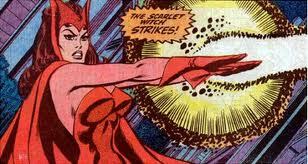 You all know that Vision and the Scarlet Witch have a special place in my heart. Rereading the stories convince me that the Marvel miniseries I knew and loved still hold up today. 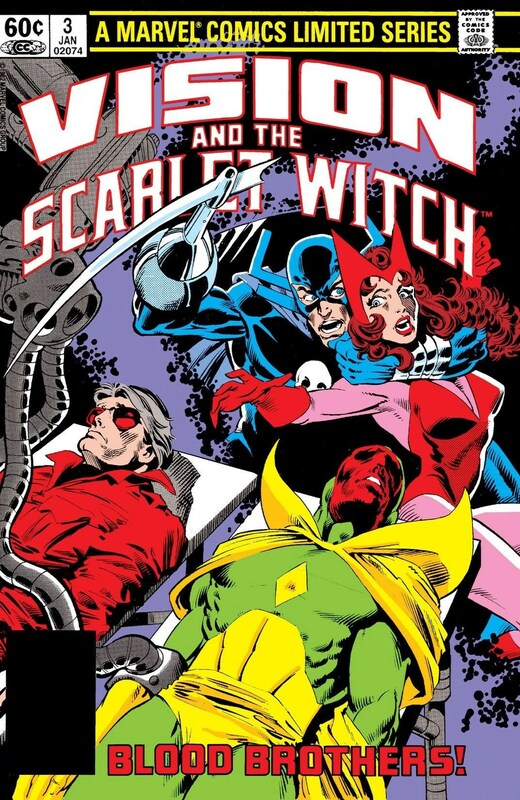 So, as followers of the blog may remember, I still harbor massive affection for the Marvel characters, Vision and the Scarlet Witch, based on their classic adventures from the 80s. 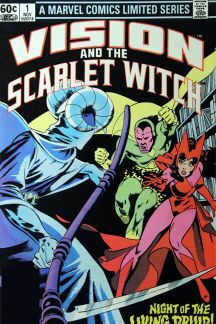 With Scarlet Witch confirmed for Joss Wheedon’s “Avengers 2”, I thought it might be a good time to revisit the classic mini-series that cemented my love for these two. Elizabeth Olsen? OK, I buy it. I picked up the original 4-issue mini-series (along with the follow-up 12-issue series) when I was at San Diego Comic Con this past July. How did the series hold up against my memories after all these years? It’s simultaneously more corny, yet more fun than I recall. Page one, a splash page, illustrates everything I love about this series. 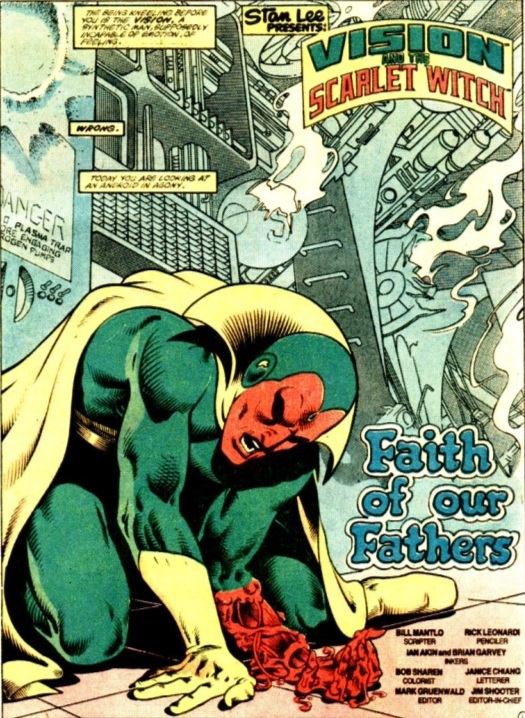 Vision is wearing dungarees and a windbreaker that bears his trademark high collar. 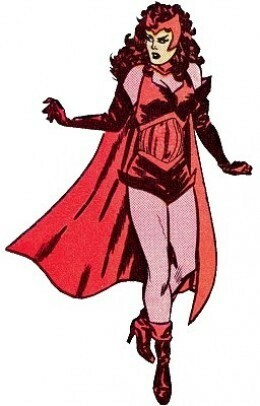 Scarlet Witch is dressed in a pantsuit, but still has her iconic cape and headdress. They’re just chilling and having a stroll on Halloween night in front of a giant mansion in a New Jersey suburb, while a kid in a Spiderman mask is the only one to notice they look out of place. 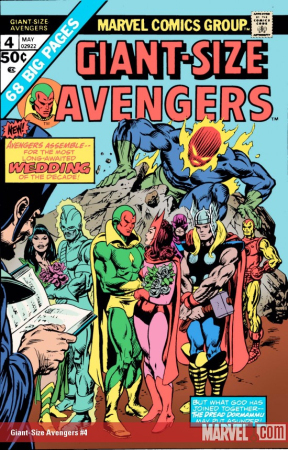 At the outset of the issue, it’s clear that the couple has quit the Avengers in order to settle down and have a “normal” life. So why are they still wearing at least 33.33% of their normal costumes. A worse disguise even Clark Kent couldn’t wrangle. But I love the clunky romance and awkward exposition that informs the reader just who this Marvel Universe power-couple is. 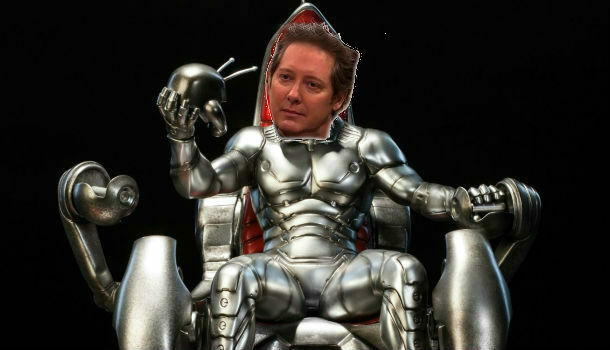 Good old Jarvis even shows up. Why would the butler employed by the Avengers drive hours to help straighten out the newly purchased home of a couple of quitters? 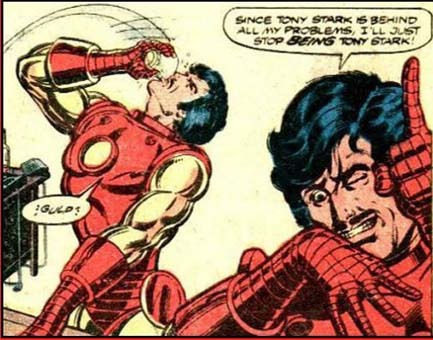 Did Stark pay him time-and-a-half? Or maybe he sent Jarvis to their house in a moment where he wasn’t thinking straight. 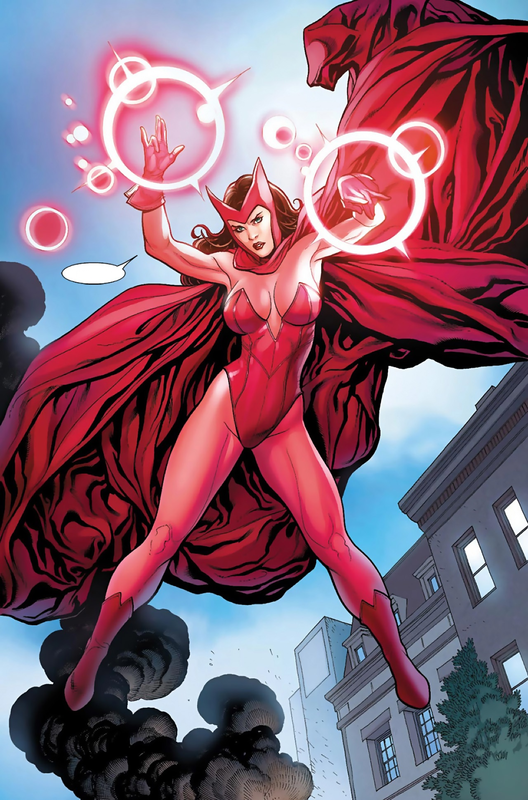 Scarlet Witch – Wanda Maximoff started as a member of the Brotherhood of Evil Mutants with her brother, Quicksilver. 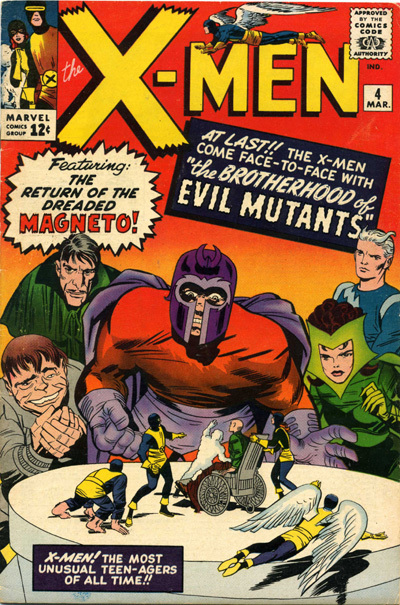 Both were revealed to be the children of Magneto. They quit the Brotherhood and were asked to join the Avengers. 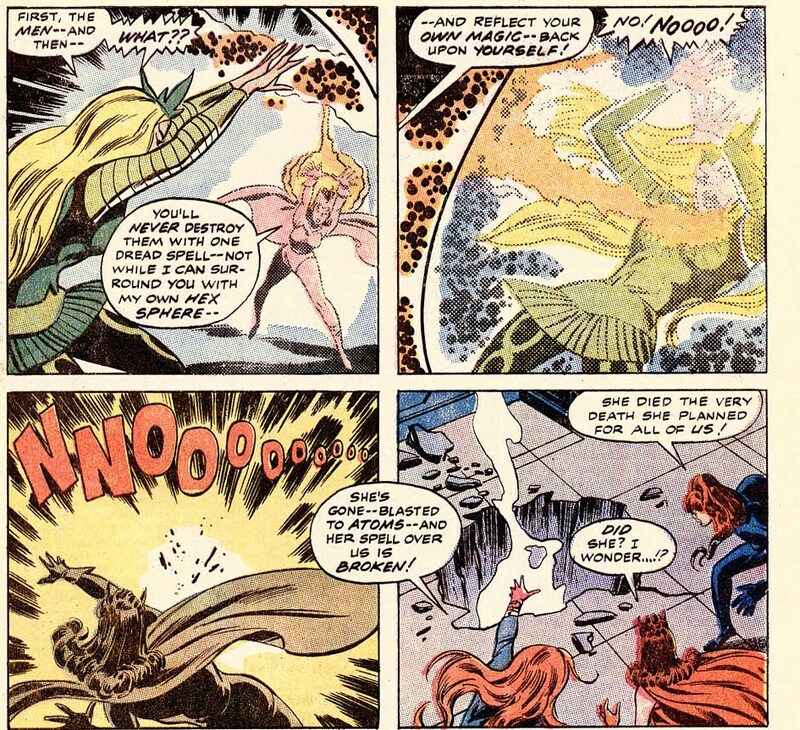 Eventually, Wanda learned to harness her mutant probability powers by Agatha Harkness, a real witch. That synopsis comes from the actual comic. If you’re like me, you might be surprised that they joined the Avengers, not the X-men, and that there’s no mention of Professor X in her education. Vision – He’s a synthozoid. So apparently that’s a thing. 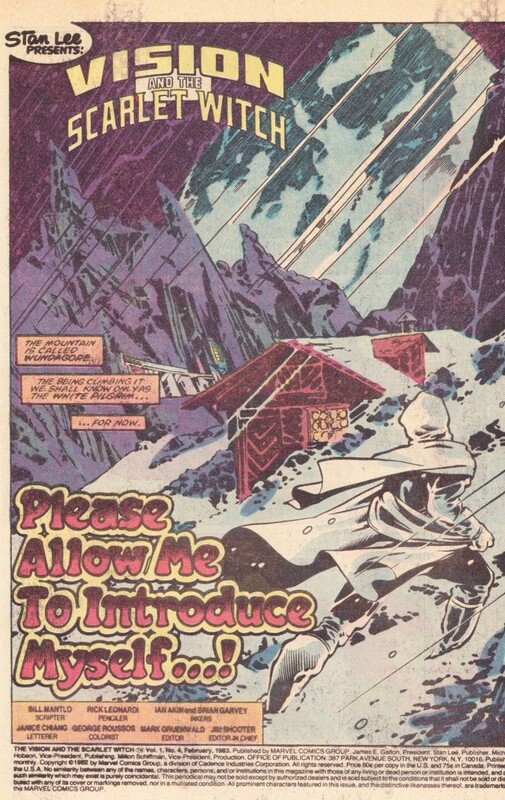 His body was created by Ultron and his mind was created from the mental patterns of Simon Williams (aka Wonder Man). Also… his body was mostly made of the original Human Torch (who was an android, not Johnny Storm). Put it all together and you have two characters with convoluted backstories – both the “children” of two of the biggest baddies in the Marvel Universe. Confusing? Sure. But, who wouldn’t root for these crazy kids to make it? Each issue in the series features a small crisis that actually serves as a springboard to dive more into the history of each character. In this issue, the couple is attacked by trick-or-treaters that have been transformed into real-life ghouls. The bulk of the issue is spent introducing (reintroducing?) 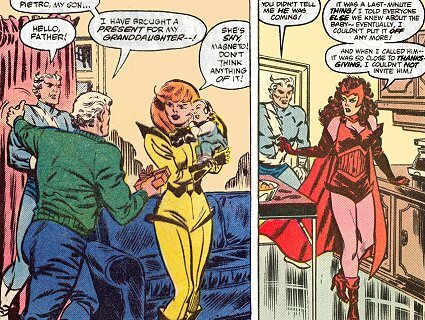 the Vision and Scarlet Witch, their life and family situation and a gloss-over on their origins. There’s a very interesting bit where Vision tries to phase through a ghost. The effect on each of them is unexpected, to say the least. In retrospect, much of the dialog may seem a bit trite, but the story is well-told. Artistically, the book still holds up very well. Several sequences are epically innovative, twisting supernatural planes and a hero who can become intangible into a visual treat. 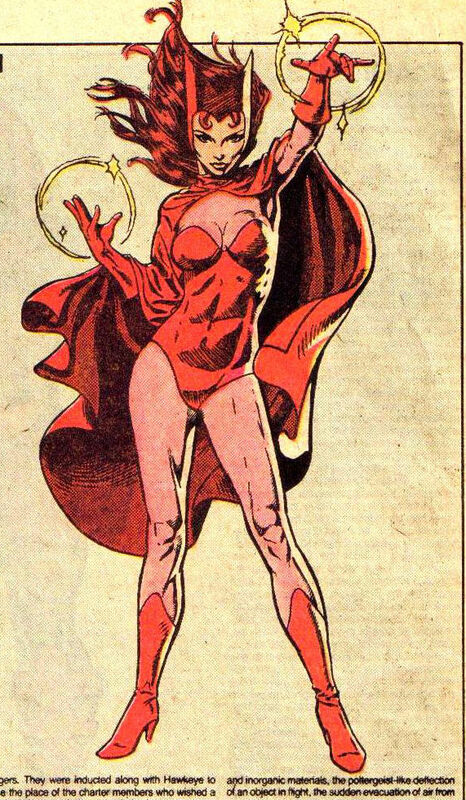 Overall, Vision and Scarlet Witch #1 lives up to my recollection and, in fact, clued me back into many parts of the Scarlet Witch’s back story I had previously forgotten. And, since it’s not really that “in demand”, I got it for a buck. You could find way worse ways to spend a dollar. This comic is certified “Casually Awesome”!